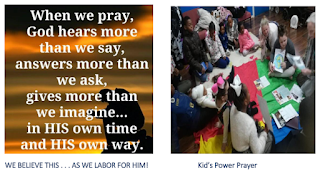 January was a great month of prayer as the New Year began. Locally, nationally and regionally there was a great focus on prayer. REGIONALLY: 57 nations participated in a chain of prayer believing God for revival all over the Europe/Middle East Region. It was a powerful display of unity against the forces of evil. 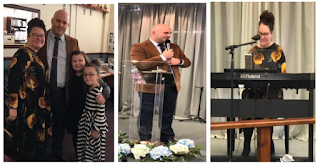 NATIONALLY: The United Pentecostal Church of Great Britain & Ireland starts each year with a week of focused prayer and fasting culminating in district prayer rallies. As prayer is focused on each church in the various districts, it brings a great sense of togetherness and unity. LOCALLY: Throughout the month of January, people from the Glasgow Church did various types of fasting—food fasts, media fasts, etc. Denying ourselves to allow God’s Spirit to flow through us individually and collectively is what we pray will last throughout the year. 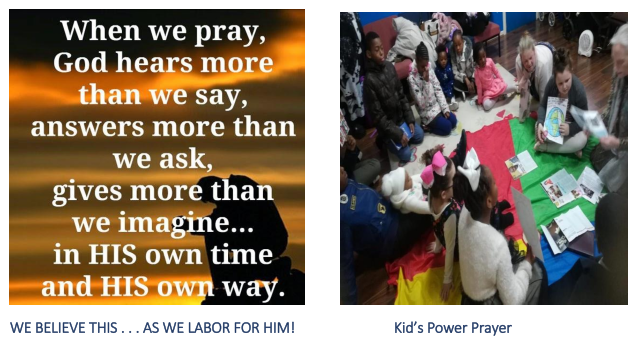 It is great to see children coming for Power Prayer before church on Sunday. They are learning to pray BIG PRAYERS for the world! WELCOME HOME TO THE JAMES BEEK FAMILY! January 13 was a day of great rejoicing for the church in Glasgow, Scotland as Pastor Beek and Family surprised them with their grand entrance into the service just before the offering. The church, who had long awaited their return from deputation, erupted in Holy Ghost chaos when they realised they were finally back. THANK YOU to I AM GLOBAL and Global Missions for speeding their return. The Beeks are much loved and much needed in the land of their calling.